393 attendees checked in so far! RIPE 67 kicked off on Monday morning with three parallel tutorials: “The IETF TRILL Protocol” with Donald Eastlake, “Managing IPv4 Scarcity When Using SSL Certificates – Multiple SSL Certificates on a Single IP Address” with Paul van Brouwershaven, and “Creating and Analysing RIPE Atlas Measurements” with Stéphane Bortzmeyer. First-time attendees were welcomed by RIPE Chair Rob Blokzijl and RIPE NCC Managing Director Axel Pawlik at the Newcomers’ Introduction Talk. Newcomers learned about RIPE, the RIPE NCC and the ins and outs of a RIPE Meeting. RIPE Chair Rob Blokzijl and Yannis Mitsos of GRnet, the RIPE 67 host, welcomed the RIPE 67 attendees during the opening plenary session of the meeting. Filiz Yilmaz, RIPE Programme Committee (PC) Chair, gave an overview of the PC’s responsibilities for the plenary programme and invited attendees to send their feedback about the meeting’s content and other PC-related topics to pc [at] ripe [dot] net. She added that on Friday there will be elections for the PC, and anyone interested should use that email address to send a biography, statement of interest and a photo. The session continued with Peter Lothberg of Stupi LLC, and his presentation “TeraStream – A Simplified IP Network Service Delivery Model”. The opening plenary concluded with a lighting talk by Franck Le Gall, “Results of 2013 Global IPv6 Deployment Survey”. There were two presentations and three lightning talks in the second plenary session on Monday afternoon. Laurent Vanbever from Princeton University gave an interesting presentation on new applications for SDN-Enabled Internet Exchange Points and the management challenges it can solve for participants and IXP operators. Georgios Smaragdakis from Deutsche Telekom Labs/TU Berlin presented on the benefits and improvements of enabling ISP-CDN collaborations. The first lightning talk was given by Tore Anderson of Redpill Linpro AS, who helped 24media deploy IPv6 in ten days. At the end of the ten days, seven out of nine sites were on IPv6. Lee Howard of Time Warner Cable presented on the state of IPv6-only networks. Finally, Jan Žorž gave a progress update on the Best Current Operational Practices (BCOP) efforts since RIPE 66 in Dublin. Benno Overeinder volunteered to work on this in the RIPE NCC service region and gave an update on what’s taken place so far. Following up on their lightning talk during the afternoon plenary session, Jan Žorž of the Internet Society and Benno Overeinder of NLnet Labs held the “Best Current Operational Practices (BCOP) BoF” to draw attention to the need for a better way to identify, capture and promote best current operational practices documents emerging from various regional network operators’ groups. They suggested that sharing these documents across the globe would benefit the wider Internet community and help more operators deploy new technologies like IPv6 and DNSSEC faster and easier. 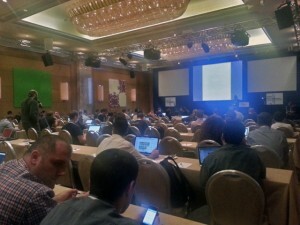 The BoF followed up on the first BCOP BoF that took place at RIPE 66 in Dublin, which led the RIPE NCC to establish a mailing list for this effort: bcop [at] ripe [dot] net. This group has already started identifying the topics that need to be addressed. Attendees appreciated the opportunity to meet the RIPE NCC Executive Board over drinks and canapés at the Aphrodite Room and learn more about the RIPE NCC and its activites. Everyone had a chance to unwind at the end of a busy and successful first day during the Welcome Drinks. A glass or two of ouzo were raised while old friends and colleagues caught up with one another and new friends were made.